The weekend away was enjoyable, I did make new friends and enjoyed the session, however I drew a blank. But at least it wasn’t only me, my fishing partner Stu and everyone else on the lake also blanked, all except 1 angler who managed to bank a 36lb common. But hey, that’s fishing…… Stu and I worked very hard for a fish, first we found out the lakes features, we tried a selection of baits at different depths, , watching crashing fish and trying to work out what depths they were feeding at, if at all they were feeding, and so on, but to no avail…….. 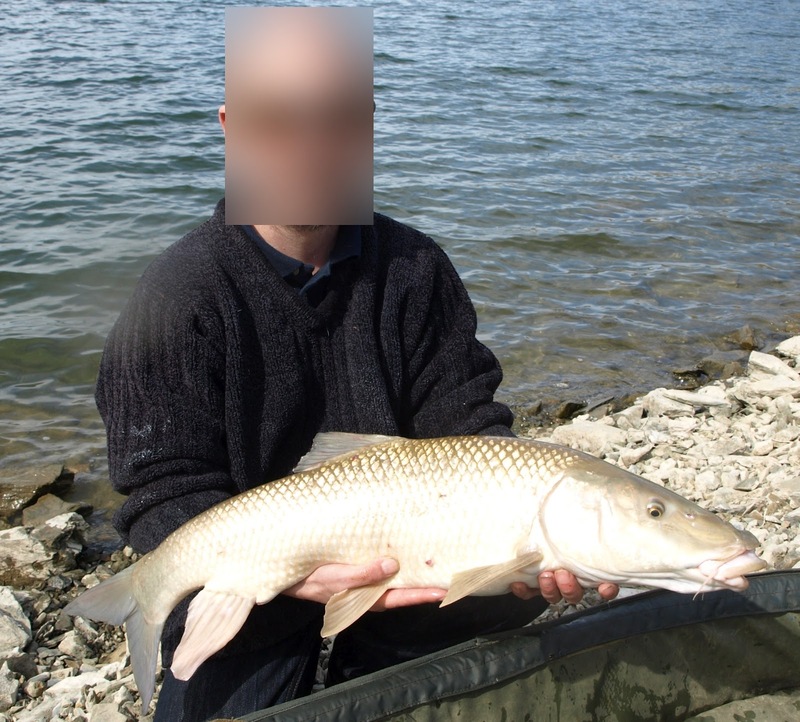 Despite the blank, I will certainly have another go at the lake, It would be nice to fish with Gaz, a friend that fished it for 4 days last year, also blanking… We shall see…. But first there’s some huge lumps in Orellana to try and tempt…. Back to the update.. Our first group of Carp anglers out this year have just left, and what a hard time we all had. Before their arrival we discussed our approach, the fishing has been very slow lately due to the harsh winter we had and the current weather…. According to the forecast the winds would be very light, mainly easterly and cold, so they opted to go for a runs for the first few days, then see what would happen with the weather, then possibly stick it out for a good fish. Both anglers are experienced and have landed many 30 plus fish from UK, however fishing here is a little different to what they are used to but they did great with their approach and bait presentation. We fished a venue where we would have more chance of runs, however the fish don’t quite reach sizes of the Orellana fish, but a 50 would be a possibility. Within the first 36 hours they had 5 runs, biggest fish of 25lb, small but more than welcome considering the conditions. On the second morning we discussed our approach for the following, and last, 36 hours fishing they would have. With a strong westerly pushing, they decided to hit the Orellana rather than Sierra Brava, and hope that the westerly had got the fish into feeding mode. After several hours of packing up and travelling, we reached the area that I had a feeling the fish would be in and we were happy to see fish topping. Most were small fish but there were the odd carp showing, IF only this westerly was to last. We only had to wait a couple of hours for the Spanish anglers that were fishing the swim to vacate the area, then we were in. Our timely arrival was Sunday early afternoon, so if there were any anglers there, they would surely be leaving after lunch, and they were. Great, but we did have to contend with their winter ´filling it in´ approach, so we presented baits around the area by bait boat with little free offerings, hoping to pick up the odd run. I talked to the Spanish anglers, they had landed 7 tench to 8lb and lost a carp, so hopes were high. Both Rob´s and Steve’s baits were out just before dark, so we were happy, even more so when throughout the night we heard plenty of carp crashing around. A little after first light the inevitable happened - the dreaded easterly, and a bloody strong one; it was bad enough having to contend with the heavy ground frost, let alone this. All hope of a run was fading away, fast, so I decided to relax and catch up on a few z´s. After 3 hours, the lads were worried, not about me, but getting to the airport the following day; however after finding the keys to the 4x4 they weren’t bothered. They were just about to check my pulse when I woke. The wind stayed with us all day, dropping slightly as night drew in, then with no warning it turned to a gale. Early hours Rob had a take and landed his first Orellana Wild carp. Only small at 17lb, but again a more than welcome fish, I was at it again, sleeping, the walkie-talkies had gone flat and I slept through the commotion of Steve filling the wellies as he landed the fish. A little after first light the wind dropped and even, for a few minutes, blew from the west, hope for a run in the dying minutes had risen. We quickly sent out the bait boat with a couple of rigs in it (one each) and before we knew it Steve’s baitrunner was screaming, he was it to an Orellana Carp. Unfortunately the hook pulled as the fish made a strong run from the margin, it wasn’t a bad fish either. It was back to packing up as the wind got stronger, yes easterly again, when out the blue Robs alarm started screaming. I immediately looked at the rod that had just gone out, but was surprised to see it wasn’t moving, it was his right rod that had been in since our arrival. As he fought the fish, we made a quick change of wellies, Rob had the dry ones on that I wanted to help land the fish, all went smoothly and after a steady battle the fish was in the net. Over the 5 days the lads had 11 runs, biggest fish a 41lb 12oz Orellana Common – a new PB for Rob. The week before, Simon and Chris ventured over in pursuit of large Barbel. 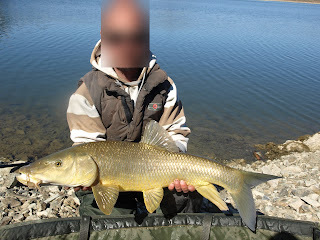 They spent half their stay on the Orellana hoping for the huge elusive Barbel that reside there, but with no luck… The other days were day sessions in 3 other lakes, they had decided to look around on their first visit and check out the variation of venues we have here. They were surprised that we had such a large choice of lakes to fish, all so different, not only in features and landscape, but baiting tactics’. Some baits work well in one lake but not the next. Chris caught steadily; nothing huge however Simon had the luck of getting into the big fish, unfortunately he had bad luck trying to land them. 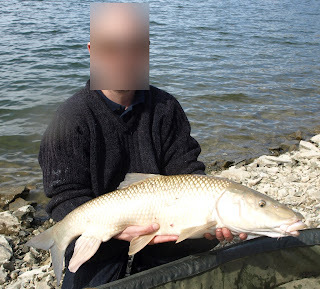 He ended up losing 3 large Barbel, unlucky mate. Heres a couple of Chris´s catches, unfortunately he is too ugly to show his face. Seriously, theres justiied reasons we cant show him. Simon, who is a qualified fly fishing instructor, and I showed each other casting techniques, He gave me tips on the fly and for him it was distance casting on carp rod, needless to say he improved more than me. Another great week with cracking lads…. If you looking to buy quality branded fishing tackle, check out the following site, there prices are unbeatable.